Kendrick Lamar: 'I Can't Change The World Until I Change Myself First' Even with To Pimp A Butterfly's success, Lamar is still conflicted about his place in music. "How am I influencing so many people on this stage rather than influencing the ones that I have back home?" Kendrick Lamar onstage at Brooklyn's Barclays Center in October. 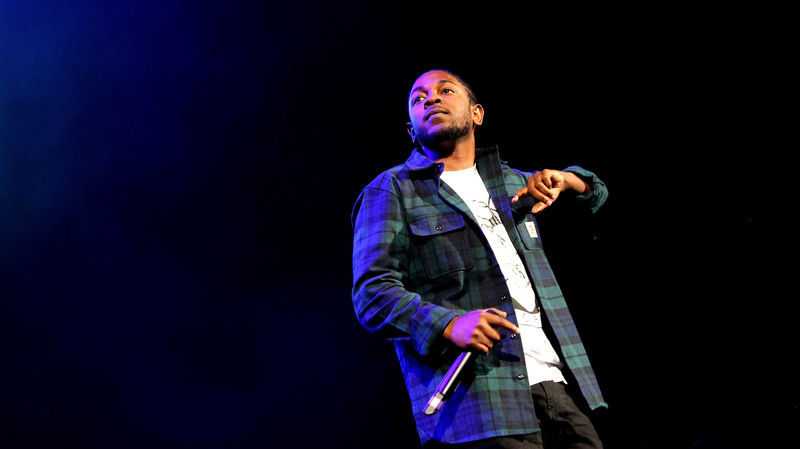 When you think of music in 2015, you have to think of Kendrick Lamar. To Pimp a Butterfly recently scored 11 Grammy nominations, more than any other artist, and "Alright" became an anthem for the Black Lives Matter movement against police abuse. Lamar grew up in Compton, Calif., in the '80s and '90s, surrounded by poverty and gang wars. He says he witnessed his first murder at age 5. "It was outside my apartment unit," Lamar tells NPR's David Greene. "A guy was out there serving his narcotics and somebody rolled up with a shotgun and blew his chest out. Admittedly, it done something to me right then and there. It let me know that this is not only something that I'm looking at, but it's something that maybe I have to get used to — you dig what I'm saying? "You grow up inside these neighborhoods and these communities, and you have friends, friends that you love, friends that you grew up with since elementary. And you have their trust, and you have their loyalty. So it brings influence. So no matter how much of a leader I thought I was, I was always under the influence, period. Most of the times, when they were involved in these acts of destruction, I was right there." Kendrick Lamar doesn't have a rap sheet himself, but he says he's hurt people. Music saved him: He spent long nights in the studio instead of on the streets, and two years ago, his album good kid, m.A.A.d city went platinum. But for a young man who grew up in Compton, sudden success was overwhelming. "You can have the platinum album, but when you still feel like you haven't quite found your place in the world — it kind of gives a crazy offset," Lamar says. "When you go inside these places, no matter how much money you have, no matter how much success, when you still feel like you're not comfortable, where's the feeling in that?" On To Pimp a Butterfly, Lamar confronts these emotions. There's a refrain that he keeps coming back to, a spoken-word piece of sorts: "I remember you was conflicted, misusing your influence. Sometimes I did the same, abusing my power, full of resentment, resentment that turned into a deep depression." Then there's a night in a hotel room, where he describes himself literally screaming out in agony. "What was the feeling? The feeling was missing home," Lamar says. "The feeling was, I should be with my family right now when they're going through hardships, with the loss of my dear friends that's constantly passing while I'm out on this road. The feeling was, 'How am I influencing so many people on this stage rather than influencing the ones that I have back home?' That's the feeling: being inside the hotel room, and these thoughts I'm just pondering back and forth while I look at the ceiling all night." Back home, Lamar says, he "probably lost more friends in this past summer than any other summer." One sticks out. "Chad Keaton. He was like my little brother; we grew up in the same community," Lamar says. "I was actually best friends with his older brother, which is incarcerated right now. And him just always telling me to make sure that Chad is on the right path. And, you know, he was on the right path. But, you know, things happen where sometimes the good are in the wrong places, and that's exactly what happened. He got shot." As much as Lamar makes the songs on To Pimp a Butterfly personal, people have taken the music to mean much more. In "The Blacker the Berry," there's one line that created a lot of controversy — "So why did I weep when Trayvon Martin was in the street, when gang-banging make me kill a n**** blacker than me? Hypocrite!" — especially because he'd become such a hero in the Black Lives Matter movement. Lamar insists he was singing about himself, but some think he's calling on people to look at their own behavior before they take out anger on the police. "It's not me pointing at my community; it's me pointing at myself," Lamar says. "I don't talk about these things if I haven't lived them, and I've hurt people in my life. It's something I still have to think about when I sleep at night. "The message I'm sending to myself — I can't change the world until I change myself first," he adds. "For instance, when Chad was killed, I can't disregard the emotion of me relapsing and feeling the same anger that I felt when I was 16, 17 — when I wanted the next family to hurt, because you made my family hurt. Them emotions were still running in me, thinking about him being slain like that. Whether I'm a rap star or not, if I still feel like that, then I'm part of the problem rather than the solution." For Kendrick Lamar right now, this somber mode is crucial, even as he realizes that the party is important, too. "I think that the depth is needed," he says. "And there's a lot of other artists doing things outside of that depth that I enjoy — that music that I can actually have fun to, and not be in depth and think about, then I appreciate that. But as long as I'm doing it right now, I'ma continue to say just a little bit more that pertains to what's going on."